Disney Cruise Line owns and operates four cruise ships that all feature the classic Disney themes and characters. 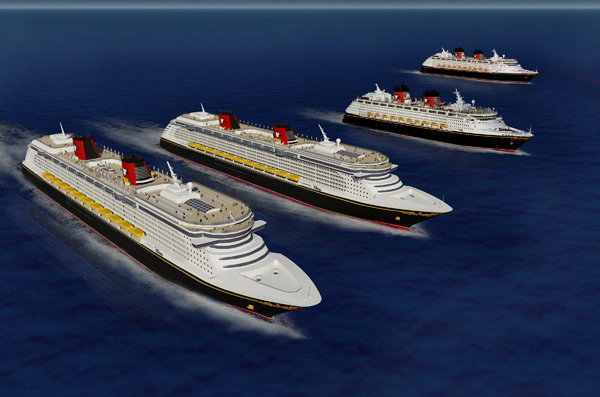 In March 2016, Disney announced its intention to build two ships, to be completed in 2021 and 2023. Each ship will be 135,000 GRT. A third ship was announced in 2017 to be delivered in 2022. Disney Cruise Line offers itineraries to the Caribbean, Bahamas, Alaska, Panama Canal, Pacific Coast and Europe. They also have a private island (Castaway Cay) in the Bahamas. Disney Cruise Line caters to families offering extensive children and teen facilities. They even have a nursery for kids aged three months to three years. On Disney’s employment website, click on the “Explore Positions” to learn more about each cruise ship job that they have on board. Additionally, in that section you will find “Additional Shipboard Positions”. Those are ship services that are provided by third party operating participants (concessions) who work as partners with Disney Cruise Line. Alternatively, on their employment pages, click on “Click to Apply” or “Search Jobs” for links to view current vacancies. Each current vacancy lists requirements and responsibilities along with a link to apply. If the job you are interested in is not available, the ‘Click to Apply’ link prompts you to select a Procurement Ally in your area. Disney previously called this a Professional Crew Advisor. Disney only works with these approved recruiting agencies to help recruit crew members from around the world. Select your region and country, or use the map view to choose a specific location.